HapYak has a Google Analytics add-on that will send interaction and engagement events directly from HapYak into Google Analytics. Details on the module are here. This is a great way to send this rich new stream of viewer intelligence into a system you already use to track the effectiveness of your marketing and digital initiatives. Go to the Integrations page on your HapYak portal. 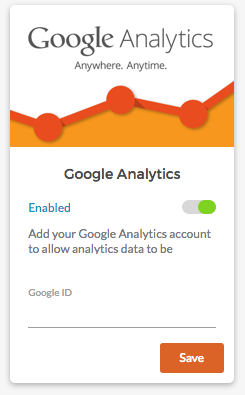 If you don't see the Google Analytics card (see below) email support@hapyak.com to get access to it. Add your Google ID (UA-...). Switch to Enabled. You're done. Here is a full list of events that are sent to GA.